This plus sized preppy look is from the current Talbots collection and is a great example of a fashion that becomes more stylish with age. In this post we will discuss how to home your personal style with age, with a focus on plus size preppy fashion. This is a fantastic question, and one I think many experience around this age. How do you look stylish, current, and true to your personal style aesthetic without looking try-hard? Whether you lean towards preppy clothing or more of a rock and roll vibe, you’ll find that things you wore just five years ago that looked chic and fun now look frumpy or even like a costume. Below I share some tips for navigating your wardrobe from young adult to grown adult without sacrificing style. 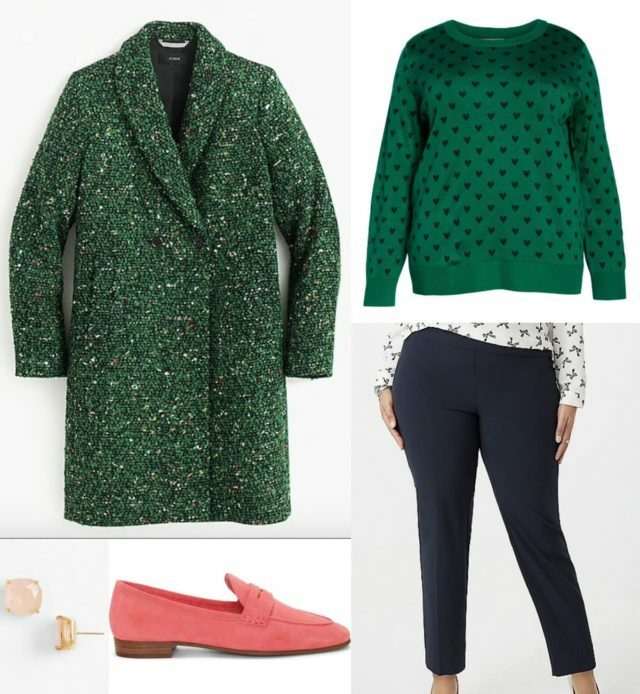 A simple green and navy look get a subtle pop of color with blush colored loafers and small pink stud earrings. The classic loafer tones down the twee of the heart sweater. The classic green color is toned down with navy making pattern mixing sophisticated. Logos, trim, sparkle, florals, graphics, embellishment… these are all things that are added to clothing to increase interest and hopefully style. Such details may have been fun at 32 but feel cheesy at 42. The best thing is simplify the wardrobe. See, as you get older you become a more defined, interesting person. Your clothing stops highlighting and starts competing. By choosing simpler pieces, you shine through and complete the look. Instead of the floral cropped pants, choose a solid color. It can be a bold Kelly Green or candy pink or even yellow, but choosing a solid over a print gives your personality space. Instead of printed tops or pieces with lace, ribbon, or embroidered trim go with a solid. Say no to overly trendy details like mixed fabrics or patterns on a single piece, cut-outs, words, intarsia sweaters (the kind with a picture on the front). If your outfit of solids feels boring, use an accessory to jazz it up. Purple plaid and red is a fun combination, but if you don't choose the right accessories the look can read cheap or childish. Black accessories with shine and plenty of personality mainting your style aesthetic while tempering the bold colors of the clothing. If you love color, rock it! However, too much color can look twee. Balance brights and pastels with neutrals. Pink with olive, yellow with denim, red with khaki, magenta with khaki. Pastels with white can feel juvenile, brights with black can feel matronly. Unexpected color pairings and tempering colors with a neutral feels both youthful and sophisticated. If you’re wearing two bold colors, temper it with a neutral for your shoes and bag. If unsure, try ivory, cream, or winter white. A soft white or cream color adds elegance to any look, elevating and making the ensemble sophisticated but not too mature. This is also a great way to also tone down bold patterns and add maturity to precious prints. With such a bold sweater, there's no need to have a lot of competition to create a stylish look. 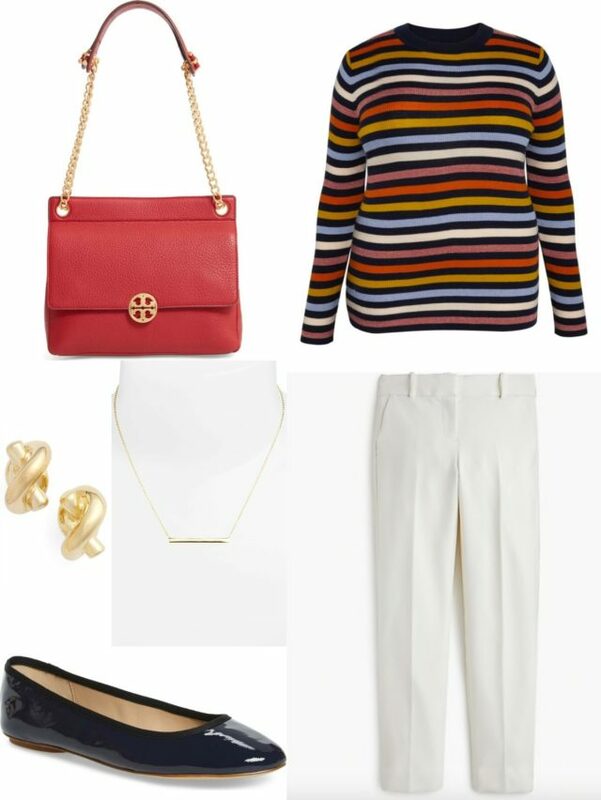 Ivory trousers and navy patent flats neutralize; a red bag highlights the sweater but the Saffiano leather and smaller profile prevent it from stealing the spotlight. A necklace extender lets you customize for the perfect length for your body and the outfit. It’s tempting if you’re wearing a red blouse to continue that red with your shoes, your earrings, your lipstick. Overly matching can end up appearing juvenile. An unexpected pairing is fresh, modern, youthful but not young. 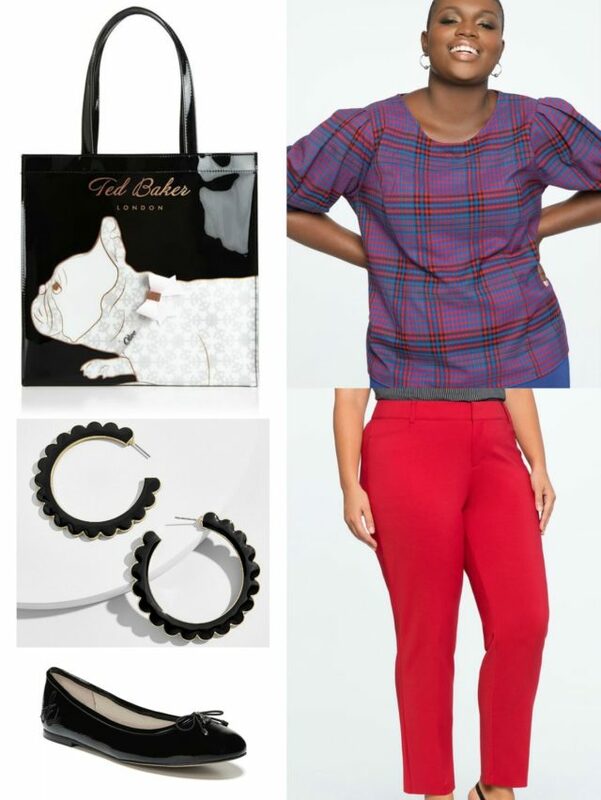 Wear a warm red lipstick with a pink dress, pair a blue plaid top and blue pants with yellow flats, let your bag be an accent color nowhere else found in your ensemble. Have a statement-making bag? Let it steal the spotlight by keeping the rest of the ensemble subtle but not at all boring. 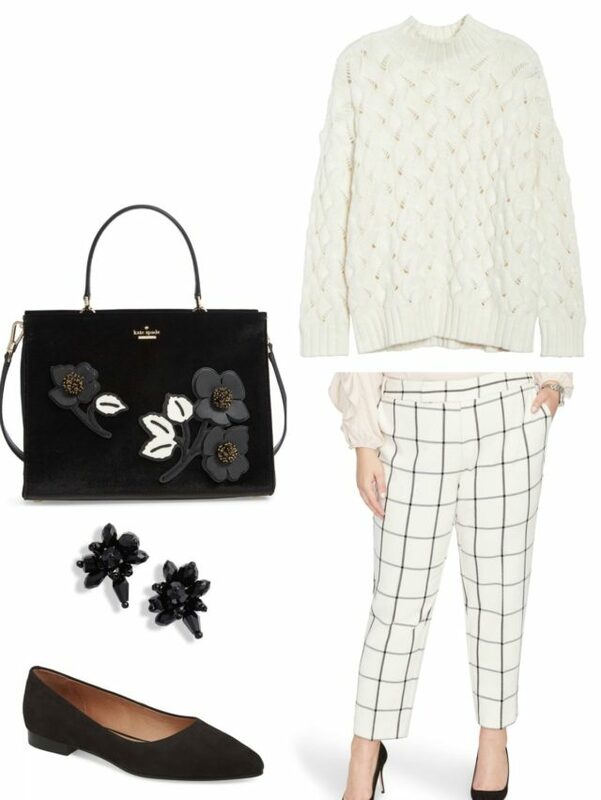 This ivory look is luxe; black suede flats and fun but not overwhelming earrings complement the bag and keep the ensemble cohesive. We’re in a time of fashion where more is more. Statement lip and statement shoe and statement earrings and statement bag. Thing is, unless you’re a style icon or 17, having so many statements can leave a look feeling try-hard. Try letting one piece be the star. If your dress has a strong pattern, keep jewelry small and just to highlight. If you have an amazing pair of shoes, choose a small neutral bag and jewelry. Feel free to glam up a simple frock or sweater with fabulous earrings or necklace but no need to do both to look amazing. Remember, you are an accessory, and as Chanel said always take one thing off before you go. Don’t let yourself be left behind! A feminine silhouette like this can easily feel too precious, but a dress in a darker print with sophisticated and subtle accessories, the effect is elegant and not at all juvenile. When you’re 28, you can wear cheap and quirky things and appear fun. When you’re 38, those cheap and quirky things look… well cheap and quirky. You’ve experienced more, you know more, you’ve lived more, you’re a more vibrant and sophisticated woman and your clothes should be as well. You don’t need a dozen different sweaters or eight pairs of jeans, you just need a handful of ones that fit and flatter your personality and style aesthetic. Don’t shop for situations, shop for your life. Peruse the archives of this blog to find tips on how to cull your wardrobe and curate a collection of clothing that works as hard as you do. And when you add to your closet, add to it with care, with thought, and with purpose. By doing this, you’ll find your closet is more cohesive and you’ll also have a bit more money to spend when you truly find something perfect. I hope these tips and sample outfits help you on your journey. Great style is achievable at any age, any size, and to fit any personality or lifestyle. You sound as though you know yourself well, and that is the most important thing when finding your personal style! Such great and timely advice! I also feel that certain looks I wore before just age me now. Your advice is spot on. BOOM! What a fantastic post to start the year! You are going to rawk 2019 lady!! I’ve got almost a decade on you, but it has taken me until recently to really fine tune my style. I’ve had a general sense for a long time – classic/preppy – but it’s only been in the last couple years when I’ve finally put aside buying things occasionally that didn’t in my style rubric. You are killing it in 2019! Love this post and loved the last one. This is so relevant for my current struggle at 47. Suddenly the all black/gray wardrobe,that has served me well in the last decade, just isn’t working anymore. Thanks for helping me navigate the needed change! Super helpful post Allie! I’m 45 and sometimes defer a little towards matronly. Lots of ideas here, a keeper! There’s no chance I will be accused of trying too hard. Sometimes it looks like and is true that I wear whatever is clean. I do take your advice seriously. I don’t take myself very seriously and tend to be self-deprecating even if it is not a good thing to do. Like the lady in Seattle, wearing jeans to the theater where I live is acceptable. Wearing a nice dress and heels would get one plenty of stares. (to continue) and my sweater was well received. I wanted to have a silly, clown like appearance and I succeeded. Would I wear my Ugly Christmas Sweater to a dignified, sophisticated party? Of course not. But the place where I work appreciates tongue-in-cheek with a high cheese factor. don’t want to look ridiculous when that is not my intention. What do you say? You are our clothing sage, after all. One style trap I’ve fallen for many times is buying clothes for some sort of fantasy life I don’t live. I mostly need clothing for daily life and working out. Only a small percent of the time do I need dressy clothing for dining out, theater (sad to say I could honestly wear jeans and fit right in here in Seattle), weddings and festive parties. Another hole is buying clothing on vacation; luau outfits just never look the same back on the mainland. Good post with useful advice! Totally agree with the buying on vacation–it isn’t just as extreme as muumuus on the mainland–the light is different back home, the weather is different back home, your lifestyle is different, people are wearing very different things and unless you are very comfortable being an iconoclast, you will feel out of place. I have coveted long summer scarves looped around necks in Germany, but cannot stand one in SC summer heat, for example. The drab neutrals of Boston look sad in SC, but the brighter colors we wear here look cartoonish up there. Me too! Once I realized that when I have to create an event in my mind to justify an outfit – it is not an outfit that I need. Best example is a silk halter dress that I loved and thought would be perfect on a cruise. Years later, tags still on the dress, I finally donated it. I never did go on a cruise. Lesson learned. “Don’t shop for a situation, shop for your life” is great advice! I have been getting into a rut of “needing something for this party” and grabbing something good enough that is inexpensive vs truly putting thought into what I want my aesthetic to be and investing properly. One of my goals in 2019 is to be more chic (for the exact reason your question submitter calls out, I’m approaching 40!) and buying less trend and investing in more well-made classics is one of the ways I’m planning on achieving it! Thanks for the guidance!